This first project will help with aesthetics. Gel staining your garage door can help make your door look brand new again (in some cases it’ll look better than new). It can also be a repair solution if your door has suffered from any weather damage. How much does it cost? This can cost as little as $15. That’s what’s great about diy garage ideas; the diy part makes them not too costly. 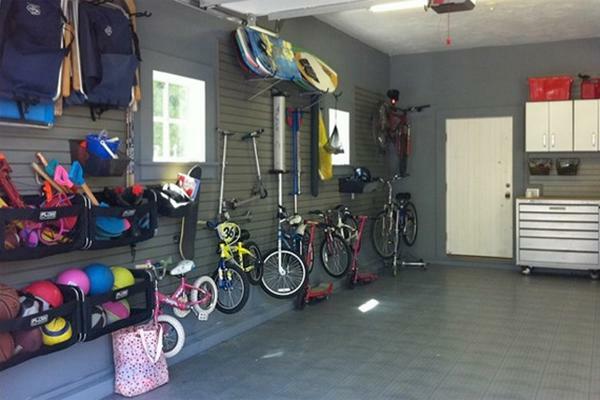 Storage often takes place in a garage, but not so often is it done well. Our diy garage ideas relating to storage will have a tip for serious DIYers and a more simple solution as well. Here we go! This one can be a bit of a task but a great asset for your home. The main benefit to building your own shelves is that every garage is a little different in terms of space and how you use it. Buy building your own, you maximize the utilization of your space. We won’t go over exactly how to build the shelves because that’s a little beyond the scope of this article, but that info is easy to find. We would, however, suggest you build them so that tubs can fit easily on the shelves. That way you really get the most use of your space. Of all our diy garage ideas, this one is obviously the least groundbreaking. However, having a table and maybe a tool wall or two is a great and easy way to improve how much you get out of your garage. A table is great for two reasons. One, it can provide a work space if you do a considerable amount of handy work from within your garage. Two, it can provide a quiet space to get some work done whenever the house might be a bit hectic. Arbors are a nice way to pretty up your garage door in a fairly short amount of time. You could build your own, but based on cost and time it’d be better to just buy one. Plus when you think about putting it together, even when you buy it it’s a bit of a DIY project. Arbors also provide shade and protect your door from accumulating sun damage as quickly. Some even grow vines up from the bottom to really make them look and smell fantastic. This is probably the most aesthetically rewarding of our diy garage ideas. Acid staining your garage floor will allow you to customize the look and feel of your floor. The result is a nice, showroom type floor that all your guests will compliment you on. The equipment to do this sort of project can be a bit on the pricy side. Around $600 would be the cost to get you started. But hey, just the cost of fun right? Plus there’s a lot of customization to it. You can make it a variety of different colors and textures, and even add a patter to the design. This part of our diy garage ideas is kind of cheating but you’ll forgive us right? If you didn’t know already, we wanted to inform you DIYers of how useful Pinterest can be for around the house projects like this. There are a ton of pictures and blog entries posted to Pinterest every day that are specifically designed to help you execute projects to improve your home. In fact, that’s where we got a lot of our ideas for this article! Plus we added in our own personal experience of course. The point is, don’t stop here!